of the same or different design. color-printer adapted from the Thermo-Re-Transfer printing technology MicroDry. with fully automatic CD/DVD-print- and copyrobots. with an integrated autoloader with 50 or 100 disc capacity. 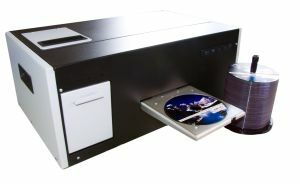 With the Thermal-Transfer printer you can print CDs/DVDs as easy as paper! The included software allows the easy creation and editing of labels with professional design. Standard graphics software can also be used for control. 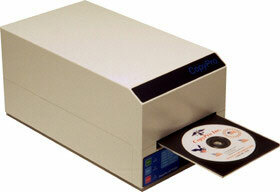 The Inscripta Thermotransfer CD-printer is ideal for printing CD-RWs, DVD-Rs and DVD-RAMs at high speed. The new ADR EXCELSIOR disc printer brings professional print quality to the industrial, high-volume user. Utilising the very latest in Hewlett-Packard inkjet technology, the Excelsior disc printer delivers an impressive 4800dpi print resolution and superior print speeds. 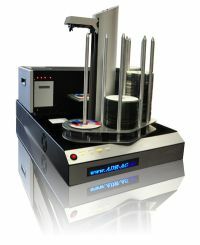 The Excellent CD-printer was developed in cooperation with HP and is ideal for printing CD-RWs, DVD-Rs and DVD-RAMs with ink-jet at a high speed. Copyright 2012 ADR AG - Advanced Digital Research.